When someone goes missing, our first response is to go out looking for them. Guided by our eyes only, we wander in all directions hoping to spot them. Our sight is our way of interpreting the world, but when it comes to missing people, other senses can prove much more valuable. In many cases, a missing person will have fallen into water, a low-lying ditch, or thick hedgerow that shields them from sight. Bad weather and poor visibility may have disorientated a walker and forced him to take shelter far off the beaten track. He may have lost his footing and fallen into a lake, or succumbed to hypothermia somewhere secluded. In a disaster scenario, if a building has collapsed or there has been an avalanche, sight alone won’t get us very far in locating missing persons. This is where search and rescue (SAR) dogs come in. Unlike us, dogs rely more heavily on their sense of smell when it comes to interpreting situations. For years, dogs have been used in search and rescue missions around the world because of their incredible sniffer skills. The canine brain might be smaller than the human one, but the part controlling smell is 40 times larger in dogs than in humans. Depending on the breed, a dog’s sense of smell is 1,000 to 10,000,000 times more sensitive than ours, with their noses boasting up to 300 million scent glands compared with our measly 5 million. When we smell, we get very little information from the air/object in question. We can smell a bolognese sauce in its entirety, but a dog can smell every individual ingredient that has gone into making it. When dogs smell, they glean an awful lot of information from the source, including whether a person is male or female, if they are pregnant or have recently given birth, where they have been, what they have touched and eaten, and what mood they are in. Dogs can smell pheromone, a complex chemical secreted by organisms, which can be found on the skin and hair, as well as in the urine and faecal matter of humans and other animals. Beside pheromones, dogs are thought to detect shed skin cells, respiratory or decomposition gases, and evaporated perspiration given off by the human they are tracking. Some SAR dogs are specifically trained to 'scent discriminate,' meaning they will follow the trail of one particular scent after receiving a sample from their handler. Other dogs will alert their handlers to any scent of a given type i.e. a human, animal or cadaver scent as soon as it's detected. Depending on a dog's training, it will follow a trail (on or off-lead) until a human source is found, lying down and barking until help arrives or retrieving the handler and leading him back to the scene. 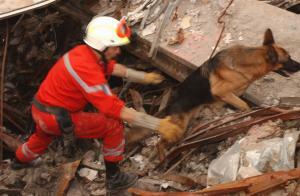 Disaster dogs may be trained to differentiate between the scent of a living, breathing human and that of a cadaver, saving valuable time in a rescue operation. Avalanche dogs are trained to detect 'pools' of human scent beneath thick packs of snow, digging when a potential source is pinpointed. The original search and rescue dogs were St.Bernards of the 1700's. Originally bred as guardian dogs in the Great St. Bernard Hospice, a refuge for distressed wanderers in the Alpine Pass, the breed soon became a popular mountain rescue dog, helping to find avalanche victims trapped beneath the snow. Other disciplines include wilderness tracking, natural disasters rescue operations, water searches and missing persons (and children). Today, a variety of breeds are employed in search and rescue missions around the world, namely hunting, sporting, working and herding breeds as these have the highest trainability and adapt well to new situations. While Bloodhounds were traditionally utilised in search and rescue (almost exclusively), they have since made way for highly skilled breeds such as German Shepherds, Dobermanns and Border Collies. The German Shepherd particularly earned a shining reputation for itself during the War, helping to locate wounded soldiers on the battlefield and alert the other men. During the 9/11 attacks, the largest ever deployment of SAR dogs made their way to Ground Zero to scour the site for bodies. In total, some 350 trained search and rescue dogs braved the site to recover what they could, supporting the ground workers both physically and emotionally for up to 16 gruelling hours a day. Deployed breeds predominantly included Labrador Retrievers, Golden Retrievers, German Shepherds, Border Collies and Springer Spaniels, although many other dogs (including crossbreeds) found themselves at the site in the ensuing weeks. Dogs trained to locate living bodies were deployed first, scrambling through the treacherous rubble and dangerous chemical fumes to recover the living. Many dogs collapsed with burns, exhaustion and from smoke and chemical inhalation. When it became apparent that no survivors would be found, cadaver detection dogs were sent in to recover bodies. A number of other dogs were also deployed for therapy, helping to lift the spirits of the ground workers and providing comfort where it was needed most. These dogs and their handlers came from all over the US, whether they were summoned there or not. Trakr, a German Shepherd police dog, arrived at Ground Zero on the morning after the attacks. At approximately 7am, Trakr indicated a 'live hit' beneath the rubble and brought it to the attention of his handler, officer James Symington. Firefighters immediately excavated the area and recovered the last remaining survivor, trapped for 26 hours beneath the heavy debris. Genelle Guzman had managed to make her way down from the 64th floor to the 13th of the South Tower when the building collapsed around her. For their efforts, Trakr and his handler were awarded an 'Extroadinary Service to Humanity' award in 2005 that recognised their heroism and training.